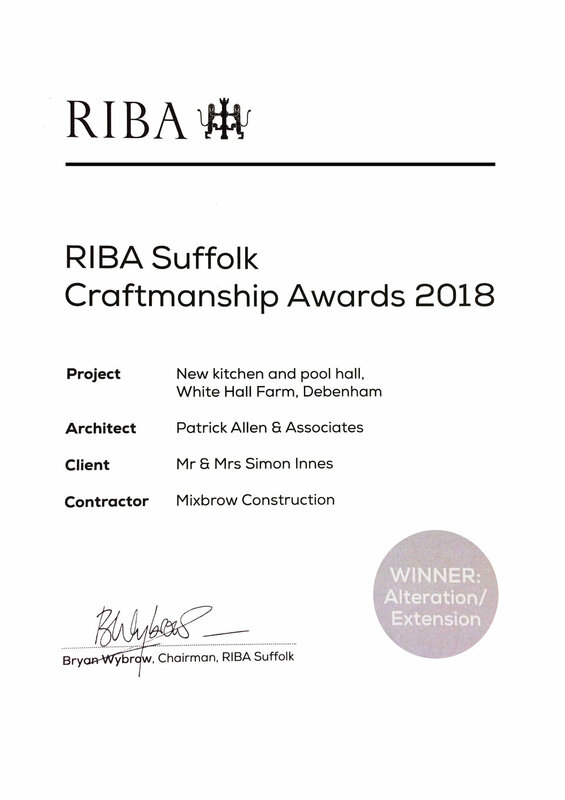 Patrick Allen and Associates are proud to announce that their involvement with Mixbrow Construction on the new kitchen and pool hall at White Hall Farm in Debenham, has won the RIBA Suffolk Craftmanship Awards 2018 under the Alteration/Extension Category. Patrick Allen and Associates are also very pleased to announce that their involvement with the Birch Group on two other projects (Bransons in Playford and the Orangery in Brightwell Hall Farm) have both received commendations in the same category. More information on Bransons, Playford and the Orangery in Brightwell Hall Farm.